Discover the countries of origin and surnames for each branch of the world’s largest Y-DNA Haplotree, comprised of more than 16,000 branches, 118,000 variants, and 160,000 confirmed SNPs from our Y-DNA database. On the haplogroup navigation bar at the top of the page (the letters A through T), click on the haplogroup name (letter). For example, if you want to navigate to the L haplogroup, click on the L on the navigation bar. The L haplogroup is displayed. Each haplogroup is made up of branches. Each branch is a specific position on a haplogroup’s haplotree. For example, the L haplogroup has 3 branches: L-M20, L-M22, L-L595. At the top of the Haplotree page, in the Go to Branch Name field, enter the specific branch to which you want to navigate. Press Enter on your keyboard. You are directed to the haplogroup page in which the branch is located, and the branch is highlighted in gray. Note: You can click the + sign next to a branch to see the downstream branches for that branch. 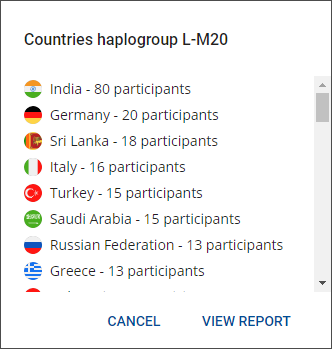 In the upper-left corner of the Public Y-DNA Haplotree page, click the View by drop-down list and select Countries. The haplotree displays the paternal countries of origin that are associated with each branch. You can navigate the different haplogroups and branches to see the associated paternal countries of origin. You can enter a country in the Search by Country field to highlight the branches that have a reported origin for that country. Note: All origins are self-reported by FamilyTreeDNA testers and may not reflect accurate haplogroup origins. Hover your cursor over a country’s map icon to display the name of the country. The number listed below a country’s map icon is the number of testers who reported that country as a paternal country of origin. If more than 15 countries of origin are associated with a branch, a number is displayed to the right of the row. Click on the number to display the full list of countries. Navigate to the branch for which you want to view the Country Report. At the far right of the branch’s row, click the three vertical dots ( ), and select Country Report. The Country Report is displayed. Branch Participants (specific branch) - Number of testers who are assigned to that specific branch who have reported the country as their paternal origin. Downstream Participants - Number of testers who are assigned to the specific branch and testers who are downstream of the specific branch (excluding other haplogroups) who have reported the country as their paternal origin. 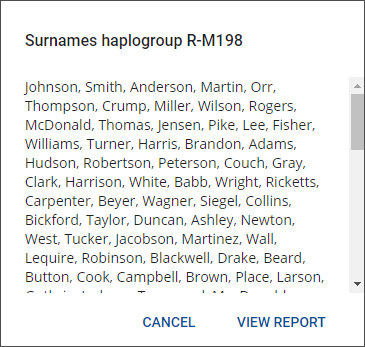 In the upper-left corner of the Public Y-DNA Haplotree page, click the View by drop-down list and select Surnames. The haplotree displays the paternal surnames that are associated with each branch. You can navigate the different haplogroups and branches to see the associated paternal surnames. You can enter a surname in the Search by Surname field to highlight the branches that have that surname listed. Note: All surnames are self-reported by FamilyTreeDNA testers. If a multitude of surnames are associated with a branch, a number is displayed to the right of the row. Click on the number to display the full list of surnames. Navigate to the branch for which you want to view the Surname Report. At the far right of the branch’s row, click the three vertical dots ( ), and select Surname Report. The Surname Report is displayed. Important: If no surnames have been reported for a branch, the Surname Report option and report will not be available. Surname – Surnames reported for that branch. Participants – Number of testers who have reported that surname for that specific branch. Distribution – Percentage distribution of testers who have reported that surname for that specific branch. 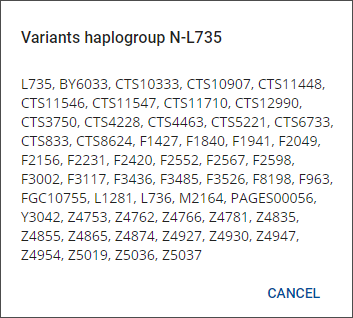 In the upper-left corner of the Public Y-DNA Haplotree page, click the View by drop-down list and select Variants. The haplotree displays the variants associated with each branch. You can navigate the different haplogroups and branches to see the associated variants. You can enter a variant in the Search by Variant field to highlight the branches that have that variant. If a multitude of variants are associated with a branch, a number is displayed to the right of the row. Click on the number to display the full list of variants.